If you're thinking about building your own S.F.F (small form factor) system, keep in mind that every compact case is unique, so no single build guide can tell you exactly how certain components will fit together in that case. S.F.F cases often arrange components in a way that makes it difficult to install otherwise standard PC parts. I finally got my hands on an AM4 mini ITX motherboard. It’s the Gigabyte AB350N-GAMING WiFi which is using AMD's B350 chipset. 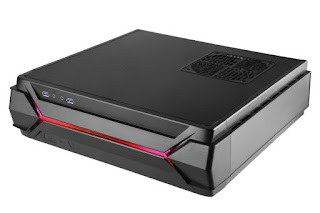 The Gigabyte AB350N-GAMING WiFi supports AMD's line-up of AMD AM4 processors, provides 2 x DDR4 DIMM slots up to DDR4-3200 supported by its BIOS, Realtek ALC1220 audio, Gigabit Ethernet, a rear M.2 Socket 3 connector, USB 3.1 Gen 1 / Gen 2 Type-A ports, and onboard 802.11 b/g/n/ac WiFi as well as Bluetooth 4.2. So if you’re looking to build a Kodi/HTPC GNU/Linux media box for the living room or just want a small form factor PC that can fit anywhere and do almost anything, this mini-ITX motherboard offers a lot of functionality for its small size. Now the Silver Stone case is the crown jewel of this build. The Silver Stone Raven RVZ03 chassis is a small enclosure with more space inside than one would think. Now, this case doesn't offer enough space to mount a graphics card perpendicular from the motherboard But Silver Stone did engineer a riser bracket that lets you place the graphics card parallel to the motherboard. They say this case has space for full-length graphics cards up to 13" long and up to 5.88" thick. So in this build, I have worked hard to put together a comprehensive set of parts that fit together nicely. Note: This is not a comprehensive set of step-by-step assembly guide. Ubuntu artful 17.10 beta with GNOME Shell Theme and Mesa 17.2. The artful kernel is now based on Linux 4.11 but they intend to ship 4.13 kernel for the Ubuntu 17.10 October release. openSUSE Tumbleweed does not really have a default desktop. Users of can choose several desktops environments GUIs like GNOME, KDE, Cinnamon, MATE, LXQt, and Xfce. Tumbleweed ships with Linux kernel 4.12.11, Mesa 17.2.0. Note: Due to the Linux kernel being updated very frequently, users who rely on proprietary graphic drivers should not use the Tumbleweed. Note: The ATI/AMD free open software drivers included by default should work very well for most. Note: If you get the AMD A12-9800, no graphics card is needed. This CPU has the Integrated Graphics (Radeon R7) built in.